Buying gifts for anyone, even if you know them well, can be difficult. This is why ecommerce stores and retailers make a fortune in easy money at seasonal times of the year. They stack their shelves high with ‘safe purchases’ like gift packs of deodorant and shower gel sets. Many of us do actually prefer to put some time, thought, and effort into what we buy for others, and therefore ensure we aren’t wrapping up socks, slippers, or the gifts mentioned above for our loved ones. While you aren’t going to be able to buy everyone such a brilliant gift as a tungsten ring, there are many reasons you should consider buying one for someone special. Although we haven’t mentioned it yet, jewelry is another thing that often suffers from ‘safe’ shoppers. There are only so many times people are going to open something and see that it’s a gold chain and be surprised and grateful. A tungsten ring goes way beyond most other types of jewelry. A person probably isn’t expecting such a gift, and it represents a refreshing change from the usual jewelry that might be bought as a gift. When you buy a tungsten ring, you’re not just buying something different, but you’re buying something with a lot of quality. There are a lot of misguided rumors and myths in existence when it comes to tungsten rings, but these are based on the low quality products that are available on the market. Take the time to ensure you’re buying the very best tungsten carbide rings, and you won’t go wrong. A piece of jewelry needs to look good. Even the most expensive tungsten ring or diamond and pearl bracelet don’t count for anything if it doesn’t look good on the hand or arm of the person who owns it. Thankfully, you know that a top quality tungsten ring is always going to look brilliant, and is an accessory worthy of being part of anyone’s appearance. When you buy a tungsten ring, you have the option of leaving it as it is or adding the personal touch with laser engraving. If you’ve made the decision to buy such a brilliant gift, why not go the extra mile and add your own personalised message or something meaningful in relation to the person you have bought it for? Buying a tungsten ring is one thing, but with your personal message added it is then 100% unique and unlike any other ring in existence. 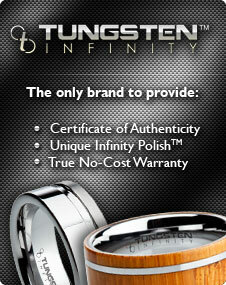 With so many strong reasons to buy a tungsten ring, why would you consider buying anything else as a gift?